The Fragile X Writers Series is going to be a little less regular in the future - I have a few more writers planning to participate, but dates not set, and I would never want to stress out my talented volunteers with deadlines.....this is all for fun, and for education, and for awareness but nobody is getting paid, and no one should lose sleep over it. Not that we Fragile X gene carriers would ever stress out over anything. No way, right? We're an easy-going bunch. We take things as they come, we go with the flow. We are chill. No wait, strike all that. Reserve it. Here's a repeat guest writer, Holly - writing on the other topic choice I gave her, namely, on herself. Who she is now and who she was before Fragile X bounded into her life. 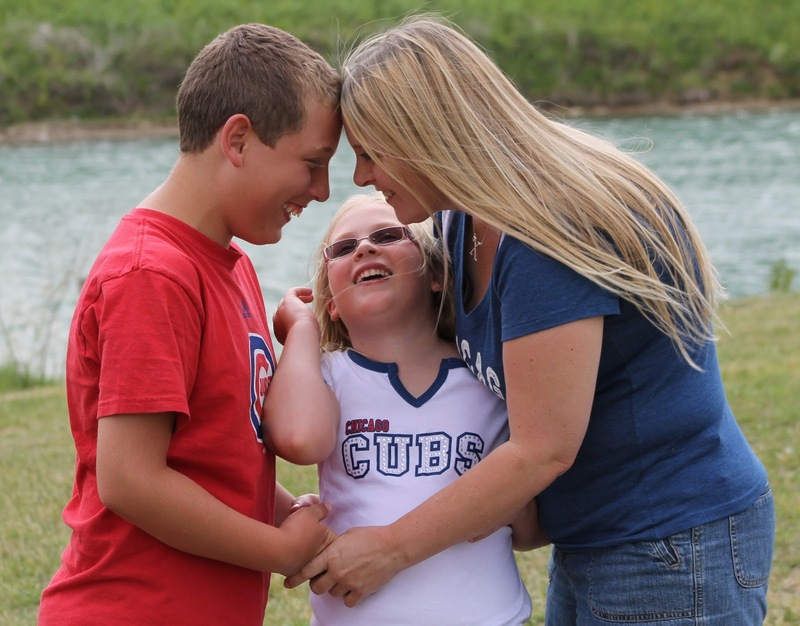 Holly is well known in the Fragile X community, and it's hard to imagine a time when she wasn't outspoken, extroverted, and everyone's friend. Turns out, she has struggled with anxiety and inhibitions, just like most of us. When Bonnie asked me to write about who I was before the diagnosis, I sat down and quickly wrote something and sent if off for her to file away for when she needed it. Last night she sent it to me to read again before she published it. As I read it I realized I didn’t really answer the question she asked me to write about (she may have realized that too) so you’re getting version 2 and this time, I hope I can answer her question "Who were you before Fragile X?" I think it’s hard for me to answer because I’m exactly the same person, there is just more to me now, and also because it’s hard to remember a time when Fragile X wasn’t a part of my life. I was quiet and shy when I was younger and while I always had friends, I never felt like I really fit in. I was happy, I had a great family, great friends and I have really wonderful memories of my childhood. I was always the peacemaker. I hated drama, arguing and for people around me to be at ends with each other, or with me. I would do anything for anyone, whether I knew you really well or barely at all, if there was something you needed – I was the person to ask. I couldn’t say no, it hurt me to see people in need of help and not do anything and I never wanted someone to feel alone. I’ve always smiled a lot. I was friends with everyone, even the people I was told I shouldn’t be friends with. I didn’t believe in the cool kids or not cool kids, I believed we were all the same. I was on the Pom Pom Squad (the dance team) and I loved that time. It was extremely hard for me, between remembering the sequencing of the steps and the anxiety of performing, I’m not really sure why I loved it so much but when the music played and I could dance… I was happy. I was insecure, add that to my inability to say no and I was… an easy target. I didn’t do great in school but I did ok – I got by with B’s well, mostly C’s. I didn’t care. I was the girl who did her homework on the bus ride to school or in the hallway before class. Math and spelling confused me and science bored me. I loved history and anything that involved essays. No matter the subject, if I could give my answer in the form of an essay – even if my answer was wrong, it would be right. If I had a penny for every time my mom told me or my teachers that I "wasn’t living up to my potential" I would still be living off the money earned for those words. She was right, though, I wasn’t. I wasn’t even trying. I was very smart, I just couldn’t get past barriers that held me back to let it show. I had one class in high school that did a quiz game every week. We split our desks and lined up facing each other. While it was focused on current events, it covered everything. I knew most of the answers but never raised my hand. Even when I thought laser beams would shoot from my eyes in frustration with the people around me for not knowing answers, I just couldn’t bring myself to raise my hand. My teacher saw it and one week he asked to write down the answers as he asked them. When I would put my pencil down, he would ask someone for the answer, at the end of class I would turn my paper in. My answers were almost always all right but I had no explanation as to why I couldn’t raise my hand and answer them in class. I couldn’t. I didn’t want to be wrong but I also didn’t want to be right. In my mind, I couldn’t win so I just didn’t raise my hand. There were a couple of times when no one would raise their hand that he would look at me, and although I don’t know his reasoning why, would ask me even though I didn’t raise my hand. I would answer, we would move on – and thankfully (even though I felt I would) I never died from it. I often felt on the outside looking in when it came to my friends and school. The older I got, the more I felt like I didn’t fit in. My friends were great – they still are. I have always been guarded, I just didn’t know why or what is was that kept me held back. Turns out, it’s this little thing called anxiety, it has stopped me in my tracks and taken more from me than it has given. It has always had a way of getting in the way. When you combine that with the guilt that I go through for anything from the way the wind blows to the color of my socks – it’s amazing I’ve ever left my house. I’ve always had something I was passionate about. In March of 1991, while I was in high school, my 3 month old cousin, Brad, died of SIDS. I coped with that, the same way I coped with the Fragile X diagnosis. I read everything I could, every time I had a paper to write or speech to give in high school and college, it was on SIDS. It was how I worked through what I felt, it was important to me to get the information out and it was how I kept Brad in my life. Then, when Parker was really little I took a 40-hour car seat technician certification class (yes, it takes 40 hours to become certified to see if someone has properly installed their car seat and we used every single hour – you would be amazed!) after my certification I pulled together and organized the first ever car seat safety check for our county. And it was awesome! I was that crazy lady who, if I saw you in the parking lot or store with your child in an infant carrier would tell you if the straps were not tight enough, the angle was off, or it was just all wrong. I couldn’t help it. I had become this car seat safety freak - everyone who becomes certified does, we are rather proud of it. This had become my new "thing" until Fragile X. As a young adult, even as a young mom, I was dependent on others – and honestly, I was great with that. I was told who to vote for, what to like, what to not like and for the most part that worked just peachy for me. I had never eaten alone, traveled alone, checked into a hotel, hailed a cab or even made a reservation. And, I was very happy with this. It was scary and intimidating to me and I had no desire to do any of it alone. To this day, I am still extremely shy and anxious. I still struggle with guilt and insecurity. I am very emotional and easily hurt. I still over think and worry more than I should. I am still the peace maker. I still hate drama, arguing and for anyone to be upset – with each other or me. Sometimes that means I apologize when I shouldn’t or back down when I should stand my ground. I still believe people are all the same, no one is better than another. I am still terrible at math and only spell decently thanks to spell check. I still love to write and have finally reached a point of sharing my writing and challenged myself to finish my book. I am still filled with a focused passion. I am, all of those things I have always been, I just keep a lot of it hidden. I am also so much more - so, so, very much more. I am a voice. I am an advocate. I am outgoing and outspoken. I don’t believe in limitations. I welcome a good challenge. I love to reach out to people, make introductions, help guide them in the direction they need to stand strong. I love to problem solve and have my brain picked. I love to help people. I believe when you say you are going to do something, you make every effort to do it, in working hard and taking pride in the work you do. I am proud, of my family, my friends, my communities (fx and non). I am open and public about many aspects of my life. And this, puts me in a position to be easily attacked and taken advantage of and that has really taken its toll. In this age of technology when we are as open as I tend to be – it’s easy for others to judge, to attack and to forget that I am… still a person. Images of my children have been taken and shared without my permission. My life has been threatened. I have been criticized for doing too much and for not doing enough. There is a human side to me. I do have feelings, I do get tired, I do not always live up to expectations. I can only spread myself so thin. This is not an "Oh poor Holly" moment, it’s a moment that I hope people will realize before jumping to make a post on Facebook to the world that they remember, I am, honestly, still human too. I am extremely proud of the work that I do. I am happy to share select parts of my life as I know how much it would have helped me early on and does help me now. I have let the world into our lives. Thousands of people have watched my children grow. I have shared the struggles and the joys with the hope that someone can relate and our experiences will help. To people who knew me before the diagnosis and to people who know me outside of the FX world – they get the shy, quiet, socially awkward Holly more than anything else and will argue with me that another side really does exists because it’s a very rare day that the confident side of me steps out in that world. To the people in the Fragile X world – they will argue that I’m not capable of being shy, quiet or uninvolved – as they don’t get to see that side of me. In that world, I am always comfortable – like being at home. My anxiety, my emotion, my passion … all understood. As much of a struggle that world can be – I’m so happy to be a part of it. I’m still not sure I answered the question… but it wouldn’t be like me if I stayed completely on topic!